Formula Ford is a single seater racing car formula that started in 1967 using a sixteen hundred cc Cortina engine in the back of a space frame, open wheel chassis with a fibreglass body. 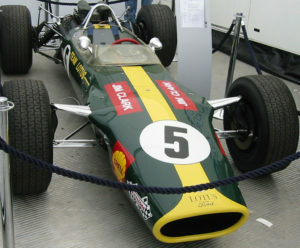 The first Formula Ford car ever was based on a Lotus Formula Junior. By this time the more sophisticated formulae were using alloy monocoques which were expensive, fragile in the event of an accident and often unrepairable at least economically. The steel space frame of a Formula Ford was still light, but very strong, relatively cheap to manufacture and it could be cut, welded, even straightened in the event of a ‘shunt’. The heyday of Formula Ford was actually a rather long period, primarily all of the nineteen seventies and eighties, although it remained very healthy in the nineties and continues today. There were spin offs, many of them, too many really which diluted Formula Ford itself for a while, Formula Ford 2000, Sports 2000, Formula First and Formula Forward, but none enjoyed the success, or attracted as much affection from race goers and drivers as the original Formula Ford sixteen hundred formula. Thousands of drivers around the world cut their racing teeth in Formula Fords in the decades mentioned, when the engine in use was the Ford Kent engine, not so easy to get hold of now, but as common as muck then. Early Formula Fords generally had front mounted radiators and outboard suspension, but because of the popularity of the formula and the relative simplicity of construction the number of racing car constructors ballooned. Joining Lotus were Merlyn, Royale, Van Diemen, Reynard, Swift, Elden, Hawke, Lola, Ray, Titan, Tiga and more. Some just made Formula Fords, whilst others like Lola were involved in numerous formulae right up to and including World Championship Sportscars, Indy cars, Formula 5000 and Formula 1. Motorsport has always been intensely competitive and so, with all these manufacturers competing to sell their chassis the development was rapid and mirrored developments in more senior formulas. As an illustration look at the Formula 1 cars of nineteen eighty three, such as the John Player Special Lotus where the driver appears to be well forward in the car and then look at the Van Diemen RF84. All Van Diemens’ model numbers reflected the year of the particular model. Soon there were side mounted radiators, inboard suspension, bodywork that smoothed the airflow around the engine and gearbox, but some things remained the same. Everyone raced with the Kent engine in those decades and although the Zetec engine and latterly the Duratec have taken over the formula is a shadow of its former self. It was so successful in the seventies and eighties for a number of reasons, firstly it was affordable, secondly it was exciting, this was due to narrow control tyres and a lack of aerodynamic devices, the cars could and did run close together, slipstream and slide. The variety of manufacturers added to spectator interest and you really could see new stars in the making. In 1972 the inaugural, end of season Formula Ford Festival was held at Snetterton in Norfolk, it would move to Brands Hatch from 1975 and it evolved into a World Cup event for Formula Ford drivers around the world. It still runs today and even in the nineteen nineties was attracting hundreds of entries from around the globe, with supporting races for other Ford formulae and historic Formula Fords. Winners of the festival include Johnny Herbert, Eddie Irvine and more recently Mark Webber, although some fourteen winners have gone on to reach Formula 1 and many who came close to winning the Festival such as David Coulthard went on to the pinnacle of the sport. It’s possible that the Ford Motor Company took theirposition as the number one in grass roots motorsport for granted, or perhaps they thought their position unassailable, but other companies wanted in on the action, prompting Formula Renault, Formula Vauxhall Lotus (Opel in other markets), Formula Palmer Audi and others. Malcolm Snook has been a skydiving instructor, car and motorcycle racer, dance teacher, advertising executive and entrepreneur and a long distance sailor. He currently lives on an old sailing ketch and writes.